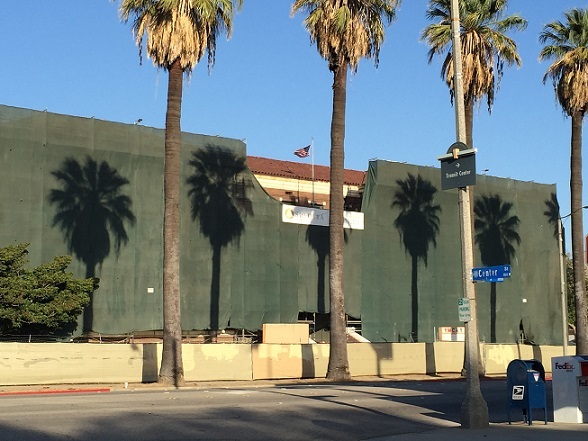 There’s a big tent-like green tarp over the old YMCA building in Pomona, due to restoration work by new owner Spectra Co. Chris Toovey, an artist who is co-founder of the nearby dA Center for the Arts, has noticed an unexpected benefit. 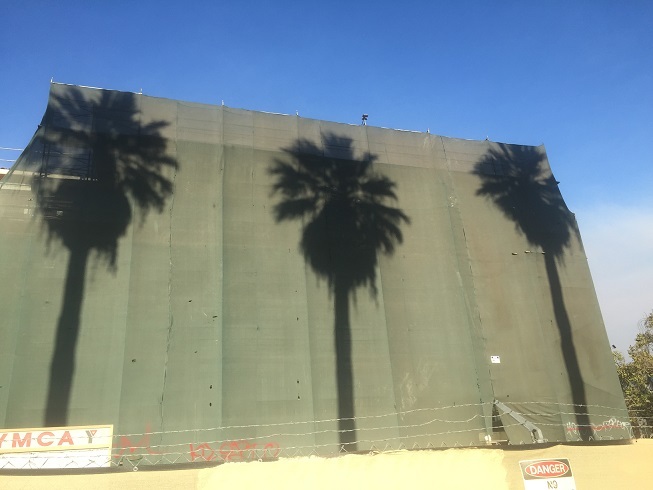 A row of palm trees in front of the building now has a screen on which to cast shadows. Sometimes throwing shade can be a good thing. Isn’t it interesting (and wonderful) how different people can see such a different perspective on things? I probably would never even have noticed the palm tree patterns, but they’re really interesting! Isn’t it, though? I’m sure I’ve driven past during those hours without noticing, or without thinking that there would not have been definable shadows on the brick building.